The waterproof watch says it’s shortly after 6 am and I’m the only person in the lineup. I solely share it with some friendly fish swimming through their home, the reef just in front of Nusa Lembongan. Shortly after dawn, the water is still crystal clear. Just before the set waves roll in, the ocean is calm and peaceful. The following article will summarize everything you need to know for enjoying surfing on Nusa Lembongan. Surfing on Nusa Lembongan – Who and when? 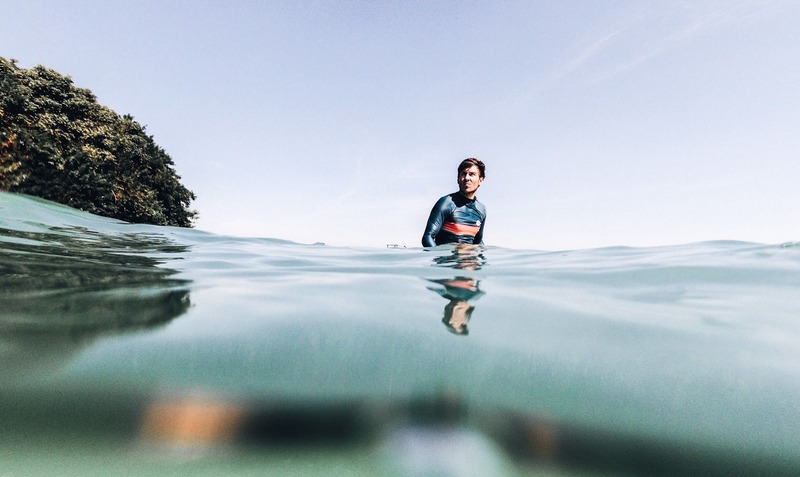 At the beginning of the year, we Europeans often think of escaping the cold winter and paddle out. A pretty good though, from my perspective! We did exactly the same in the last three years with travels to Sri Lanka, Mexico, Nicaragua, and Indonesia this year. This time of the year has many advantages as the prices aren’t as high as they will become later in the year and tourists crowds haven’t arrived yet. Waves during this time are often not perfect but on Nusa Lembongan, you will always find a wave to ride, that’s almost for certain. During the European summer, the ocean is pumping and the friendly spot Playgrounds you saw in the beginning of the year will produce grinding 6-10ft barrels. Thus, this time of the year, from June – August, is rather suited for the more experienced among us. March, April, September, and October are also great months to come to Indonesia as waves won’t be too high most of the days (but can be). Due to the fact that all spots on Nusa Lembongan break on the reef, the entire island is not exactly a beginners’ Mecca. If you are considering surfing the very first time, I would rather jump in the water in Canggu. Here, you’ll feel safer. As always, there are a handful of things that are handy to know upfront! Here I collected the main points for you. All three surf spots – which I will describe in detail later – are located in front of the beach Jungut Batu. The southernmost, Playgrounds, is the only one you can reach with a comparatively easy paddle from Coconut Beach (Song Lambung). Lacerations and Shipwrecks are far more comfortable to reach by boat, especially for the way back! 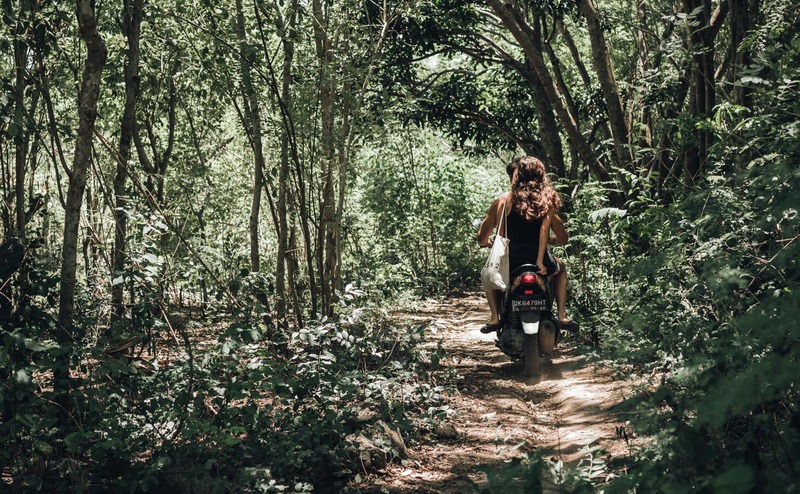 Despite the fact that the island is tiny, you need a scooter to get from A to B to enjoy surfing on Nusa Lembongan. Ideally your scooter also has a surf rack, which carries your surfboard while you explore the picturesque island. Driving the scooter on Lembongan is extremely chilled! The traffic isn’t insane as you might be used to from Bali. Pro tip: Anyways wear a helmet! Better safe than sorry! No waves for you with a broken head! We have been on Lembongan in February and came back in April at the end of our 3 months trip through Indonesia. In this time of the year, the Indonesian wave machine is not switched on yet but there are still waves you can surf. Whenever it’s flat, on Ceningan, you will find a true well magnet. However, the great thing around this time of the year, the island is comparatively calm as the sheer masses of Chinese tourists (that are supposed to come during high season May-Sep ) haven’t arrived yet. As mentioned above, you can surf in any of the three surf spots. Playgrounds, Lacerations, Shipwrecks are the options you have to be precise. Playgrounds is most likely the softest wave of all three, whereas Lacerations can become really evil and massive (actually all three can during summer). While we’ve been on Nusa Lembongan, Playgrounds worked best and I enjoyed myself in the turquoise waves, a beautiful reef under my feet in a very friendly atmosphere with surfers from all over the world. To reach Playgrounds you make your way through the jungle to Coconut Beach and paddle out. Be sure to save some power for your way back as the currents can be challenging with tired muscles. Due to it’s proximity to the beach Playgrounds is most suited for less experienced surfers who didn’t come on a boat. Works best around mid tide. Take care of urchins, rips, and rocks while Surfing on Nusa Lembongan. Lacerations tends to have a little more size than Playgrounds and can be reached by paddling past Playgrounds. The way back could be painful, but some locals made it look easy. But they rip anyways. 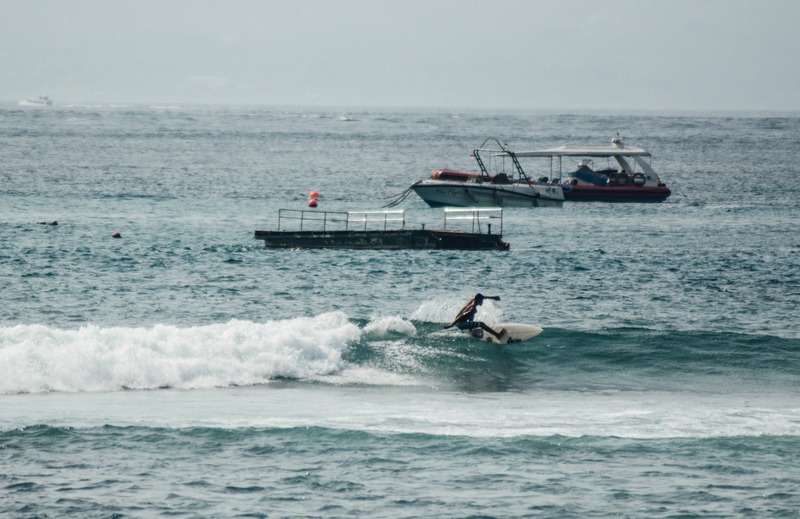 As most spots around Lembongan, Lacerations can break on an extremely shallow reef, so better watch the tide and other, more experienced surfers. On smaller days, Lacerations can also be a great challenge for advanced beginners (around high tide) and intermediates. A surf spot that needs some water. Consequently, Shipwrecks is pretty much non-existent during low tide and starts to work when it gets a bit higher during mid and high tide. Then, it can work really well, forming a great right-hander wave. Be careful, the reef can be shallow and sharp. Can be the best wave in the area but needs a bit of swell to work. Surfing on Nusa Ceningan – The beauty and the beast! Literally! The aforementioned swell magnet on Lembongan’s little brother is as beautiful as it can be intimidating. 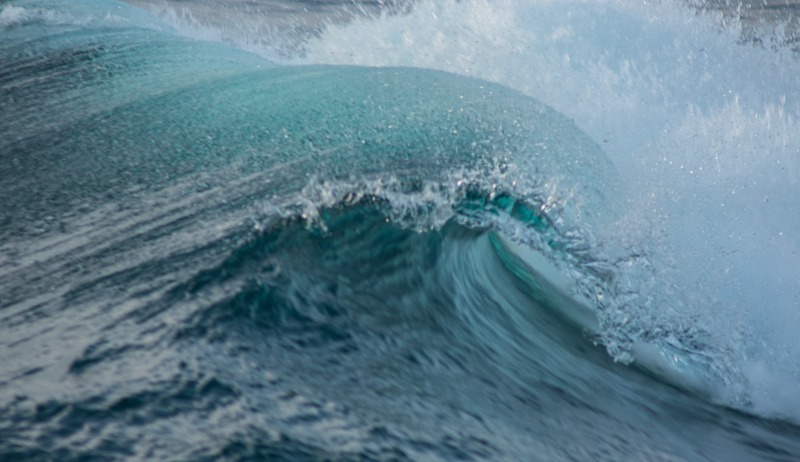 Here, a deep water wave hits an extremely unprotected and shallow reef. The result, Mahana Point, a beauty of a surf spot. Just jump in the water when you know what you are doing. The currents can be strong, the set waves can be high and powerful. I, unfortunately, didn’t go out as the ocean wasn’t exactly calm the days when we have been here. As soon as Ceningan is bigger than 4ft you don’t see any beginners in the water. If you are there, either jump in when you would consider yourself as a more experienced surfer or get a beer and watch the local kids playing with the waves. Tip: Don’t rent surfboards directly here, the prices are absolutely nuts and the boards are garbage! One thing for certain – you won’t be bored. Not when your muscles are sore or in the time in between sessions. You can do multiple things such as exploring the area, insane snorkel trips, and cliff jumping. Luckily we wrote an entire post about everything you need to know about the highlights on Nusa Lembongan. Before going, you need to decide whether you want to stay closer to Jungt Batu, where you will arrive most likely, or at Mushroom Bay. During our first stay, we stayed at the main road, close to Jungut Batu, which was great as everything was just a few meters away. Warungs, Shops as well as restaurants. During our second stay, we wanted to stay closer to the beach and ideally in the middle of the jungle. Luckily we’ve found exactly that with the insane Darsan Cottages*. You will also find more info on where to stay on Nusa Lembongan in our detailed Nusa Lembongan article. If you are a more experienced surfer and you would prefer a specific board, be on the safe side and bring one from Bali. There are multiple rentals on the island but none of them (of which I know) have fancy boards or a great selection. I found a cool renter at Coconut Beach (not the first one, but rather the second on the right). He was friendly, had the board I was looking for and made a good deal for renting the board a couple of days. In general, board rental is more expensive than on Bali. However, think of bargaining. I paid a fracture of the initial price as I was persistent for a while. I appreciate ballpark figures to plan my stay. Here, the money I am most likely going to spend plays an important factor. As we are still in Indonesia, prices are comparatively low and even longer stays can be quite cheap. 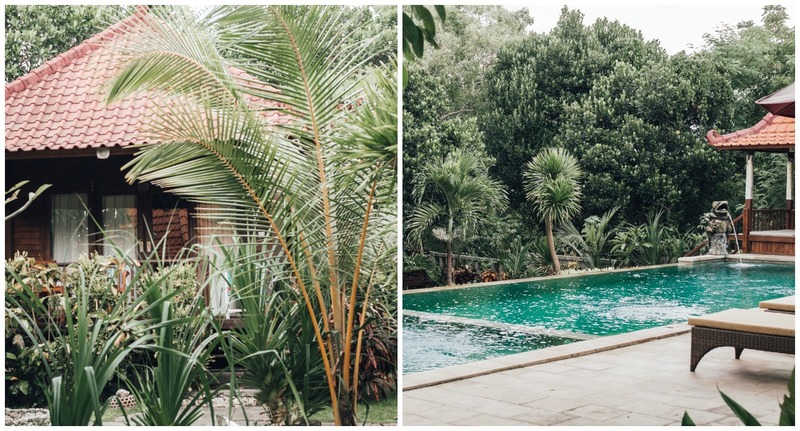 On Lembongan, we didn’t stay in the cheapest accommodation possible as we wanted to enjoy ourselves and have a pool for post surf session relaxation and paid approximately $20 per night. 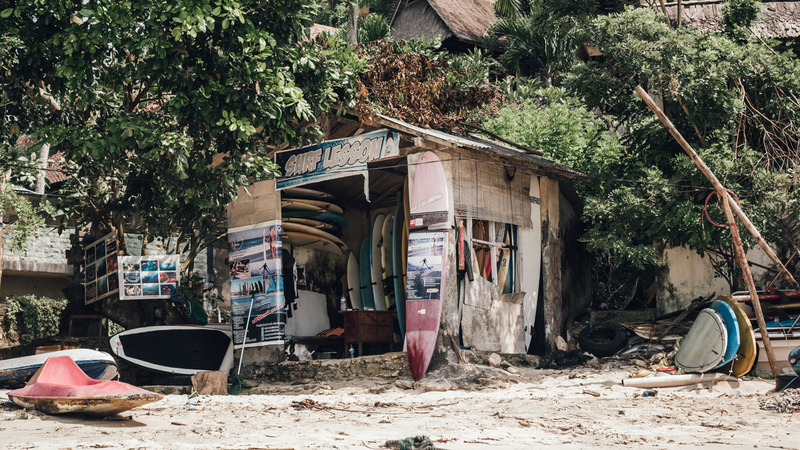 I hope I was able to bring across how much I fell in love with this place and gave you some helpful tips for your time surfing on Nusa Lembongan. ➳ Surfing in Peniche – The surf mecca! ➳ Surfing in Spain – When you travel in September, it might be a good choice! *Affiliate-Link | When booking, we receive a small commission, without any extra costs for you!